Mr Mac is growing chips! One of the first things we did in our garden when we moved here was plant loads and loads of potatoes because they are good for breaking up the soil. Mr Mac had experience of growing potatoes but when he started talking about seed potatoes, chitting, first earlies, second earlies, maincrop and haunching I realised there was slightly more to growing potatoes than I thought. It sounded complicated and for a while I buried my head in the sand and just let Mr Mac get on with it. However, this year I decided to “face the fear” and work out what it is all about. After all, everyone else seems to be doing it so it can’t be that hard! Seed potatoes are not seeds but commercially cultivated tubers which you buy in bags from garden centres. Potatoes are classified according to the length of time they spend in the ground. “Earlies” are ready for lifting first, then “second earlies” and in late summer, early autumn, “maincrop” varieties. Potatoes will be ready to harvest sooner if the seeds are encouraged to develop shoots or sprouts before they are planted. This is known as “chitting”. As potatoes grow, draw up earth around the stem so only the tip is exposed. This is known as “earthing up” or “haunching”. First and second earlies are ready for harvesting when the plant flowers and the foliage is still green. For maincrops, once the plant has gone brown and died completely, cut it down to ground level but leave the potatoes in the ground for another week. This allows skins to harden for storage. Maincrop potatoes should be lifted on a dry day and left on the surface for a couple of hours to dry. They should be stored in a cool dark place in a hessian sack which allows moisture to evaporate. Crop rotation is important. Never plant potatoes in the same place two years running. That first year we had so many potatoes we could have put McCain’s out of business! The purpose of growing so many was to break up the soil, which it did, but it also meant we were overrun with potatoes. We have never managed to store them successfully and the other major problem we had was worms. Probably 75% had been eaten by worms. We know worms are good for the soil which is fine as long as that is where they stay! We had the same issue in year 2, even though we grew them in another part of the garden so Mr Mac decided all potatoes must be grown in a worm free zone. The solution? 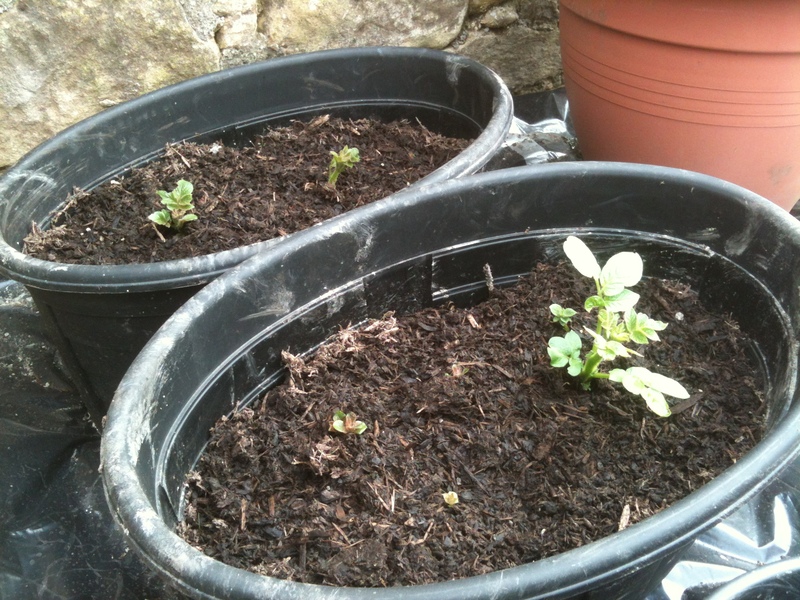 Compost bags turned inside out, a half whisky barrel and some deep pots. We roll the compost bags down, put compost and one or two seed potatoes in the bottom and cover them. When the plant starts to grow, cover the stem and as more depth is required, just unroll the bag. With the barrel and pots, the same applies. Start shallow and allow enough depth to keep adding compost until the potatoes are ready to harvest. You can harvest one bag at a time by simply turning it out and collecting potatoes. There is no risk of stabbing the potatoes with a fork and they can be left in a quiet corner of the garden or kept inside and moved out once the risk of frost has passed. Easy! This year we have planted a first early variety called “Foremost”. It will be ideal for new potatoes and salads. The other two varieties we love are both maincrops. Maris Pipers are good all-rounders and perfect for chips. Pink Fir Apples have a pink knobbly skin, a waxy texture and nutty flavour, perfect with just some salt and butter mmmmmmmmmmmmmmmm. The Foremost are well on the way. 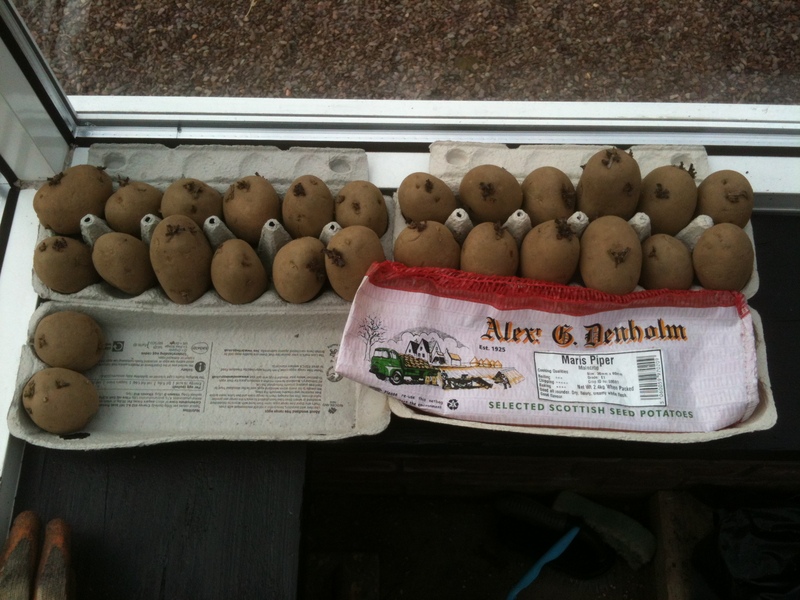 The Maris Pipers and Pink Fir Apples are happily chitting in the greenhouse. Mr Mac has an acquaintance who told him about an ingenious method he had devised. He did not have any growing space in his garden so he used old car tyres and just kept piling them up and filling them with compost as the plants got taller. Apparently his mother was moaning about the tyres making the garden look untidy and had told him they had to go. His reply was, “They can’t go. I’m growing my chips in them”! This entry was posted in Vegetables and tagged chips, chitting, cooking, first earlies, food, foremost, gardening, growing potatoes, maincrops, maris piper, nature, pink fir apples, plant potatoes, plants, potatoes, second earlies, sed potatoes. Bookmark the permalink.